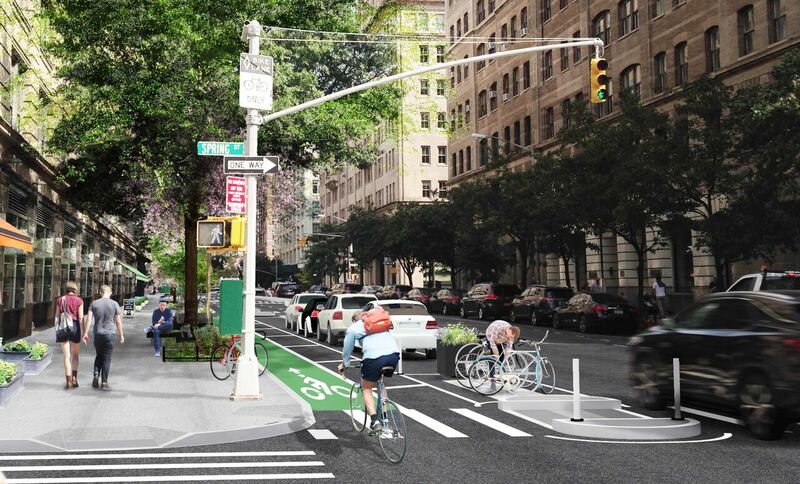 The New York City Economic Development Corporation (NYC EDC) and Department of Transportation (NYC DOT), in partnership with the Hudson Square Connection Business Improvement District (BID), announced a major investment for the Hudson Street streetscape in between Canal Street and West Houston Street. W and AKRF's design for this streetscape will improve pedestrian, bicycle and vehicular safety; and transform the corridor into a boulevard that will extend sidewalks up to five feet and add new street amenities along seven blocks. The $27 million improvement plan also includes over 8040 SF of planting areas, continuous tree pits and permeable paving to improve stormwater collection, new seating for 168 people, space for future sidewalk cafes, reconfigured sidewalks and pedestrian ramps, a protected bike lane, and new bike racks. Construction will begin in Spring 2019 and should be complete in 2021.